Do you want to learn some easy yo-yo tricks but you don’t know where to start? In this article, I will teach you some easy yo-yo tricks for you to learn and to practice them to become a master. I will start by presenting the next 16 yo-yo tricks that you must know. Now you should start by practicing the following kind of tricks. For this trick, you need a responsive yo-yo. If you don’t have one make sure to purchase one. Start by throwing a good sleeper. Now use your left grab the string through the L-shape created by the right index finger and the thumb. Now you aim to shoot and then you release the string from your left arm and just let the yoyo fall. As the yoyo is responsive, it will come back to your hand. This time you no longer need a responsive yoyo because you don’t have to wind up the yoyo. Use your left hand and use your thumb and index finger to pinch the string from the middle. Raise your left hand up into the air and then pinch again the same string with the right hand 3-4 inches away from the toy. Now you have two strings coming from the left hands passing through the right index finger and the thumb. The next thing you’re going to do is to put your non-throw hand into the loop created by your left-hand fingers and use of your thumb and pointing finger to extend deal the loop and make it wider than normal. Now bring the right hand near your mouth and the left-hand as far as you can from your mouth at this stage you see that a triangle is formed and that has a similar shape with a slice of pizza. What you need to do is to approach your left-hand to the right hand to make the pizza slice shrink and then you can add some special effects to your trick such as making specific sounds that imitate the eating process. While doing that you will see that the string will slide through the index finger and the thumb. Eventually, we’ll have now any string left to eat( metaphorically speaking). Congrats, you finished the trick! Here you need a response yoyo too because the silly stunt has a similar behavior to the shooting trick. Pinch the string 5 or 6/8 inches away from the knot on your right middle finger. Now take the string and put it between the pointing finger and the thumb. Repeat this process three or 4 times until you will observe that you have a spaghetti shaped string on your yo-yo hand. Now you create a sound effect similar to a slab and then release the yoyo it will soon wind up and come back. To be more exotic, you can pretend to use salt to sprinkle on your spaghetti. Happy eating! You can use both types of yo-yos, responsive and unresponsive. You first throw the yoyo and perform a rock the baby trick. 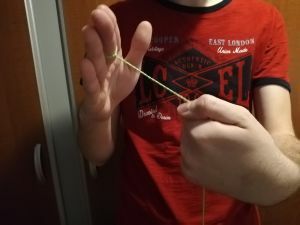 Next, pinch the strings above the yoyo with your right hand and pointing finger and move your fingers off to the side to let the toy spin around the pinch point. You flip the skill toy towards your body and complete three or four revolutions or how many you can or want. Then you can release the string and eventually, the yoyo will wind up if you have enough luck. It’s really that simple! You can use both types of yoyos. Take your opposite hand to the yoyo hand and bring it in front of the string and push against a string towards your body. Draw the hand over your right middle finger and the string should overlap your middle finger precisely. Then, you will cover the middle digit and push the non-throw hand the second time against the string. Next, you raise your left hand over the right middle finger.M ake more distance within the loop wrapped around your left-hand the same way you spread your finger to make the yoyo fit into the cradle. In this case, you will end up with a mini cradle which allows you to swing the yoyo back and forth. You can do this as many times as you want and then you can dismount let’s say by bringing that triangle of strings (the cradle that surrounds the yoyo)outwards sot to not make knots during the process and then you can just release the string. Congrats, you completed the trick! Now use your right hand: take your thumb and the little finger and place them at the left of the string that comes from the left pointing finger to the yo-yo. Pull the string to the right in order to sit on the thumb and the pointing finger. The next thing you’re going to do is to pinch with the non-yoyo hand the string next to the yoyo. The distance between the pinch point and yo-yo is about 2 or 3 inches. Just pinch at that place and then take your throw hand and roll over the pinch point in order to put it in front of the yo-yo. As you move the right hand under your yoyo you will see that the palm will become the base of the pyramid. The last thing you have to do is to swing your yoyo back and forth through the greatest space within the pyramid and that was it. Well done! In this trick, you need to exercise your finger literally. You will need to wrap your fingers around certain strings and you don’t want to miss. To start you don’t need to throw the yoyo just let it hang. Now bring now take your thumb and lift the string as you would do in a plastic whip as shown in another article. Then you wrap the string around the ring finger and you will have a certain formation. You have the string starting from the middle finger knot and then the string wraps around the thumb and then comes around the ring finger ( the wrap is from left to the right). Now take the string and put it over/above your pointing finger then take the string and coil it once around the pinky. After that, you take the remaining string above your middle finger and then pass it again above the thumb. You don’t need to throw at first. You start just by letting the yo-yo hang. Now you hold to grab the string with your non-throw hand as if you have been doing a thumbs up and placing the string between the four digits and the palm. Pull the string to the left. The string above your left-hand should be perpendicular to the ground plane and parallel to your body, then grab the string with the right hand. At this stage, you obtain a triangle. Take the right pinky out of the triangle and hook the string with the yoyo attached then pull to the right. You have the Jamaican Flag. Firstly, karate chop your thumb and then grab the string and pull it towards your body as if you were performing the shooting the arrow trick. Then create a space with the four fingers of your left hand (don’t use the thumb). You obtain a space similar to rock the baby cradle. Take your left-hand index finger and hook the string coming from your thumb and just pull it through the cradle loop out. Next, you can adjust the string up and down by moving your yo-yo hand up and down. Use the throw hand pointing finger and drag the string to the top. Take your middle finger and put it parallel to the string coming from the area. Now you have a string Eiffel Tower! This trick is just the Eiffel Tower but upside down so just do this trick and then take your left-hand. Put it below the right-hand and just pull downwards and you have that reverse Eiffel Tower and has a shape similar to a Y. In this trick, you need a responsive yo-yo. Start off by throwing it. Raise the right elbow to your shoulder level and place the yoyo string behind your arm or your shoulder. Just pull the toy(tug) and flip it over your shoulder and make it come In front of you. If it doesn’t work that way, pinch the string 3-5 inches from the yoyo and tug it. This will surely make the yoyo respond. Throw the yo-yo. Perform a sleeper. In this case, you need a really responsive yo-yo, exactly looping yo-yos such as the fizz and Yomega Raider. Take the left-hand and hold the string by using the pointing and middle finger. Swing the yoyo outwards and then release the string from the holding fingers. The last step you need to do is to perform a regular to 2A loop. Throw the toy. After that, you let it roll onto to the floor and let it move forward. After that, you lower your throw hand to the ground and then tug the yoyo and make it come back. The starting position is the following one; hold the yoyo wind up in your throw hand and place your palm facing backward, near your hip. Throw the yoyo outwards from the initial position. Turn your hand 180 degrees, tug the yoyo when it reaches its limit(all the string has been used) and catches it onto your hand. This is very useful for increasing and reducing tension in new your string as it may cause you some problems when you are playing 2 A tricks. To do this trick you need to throw the yoyo almost horizontally to make the yo-yo string turn around a yoyo’s edges. Do the same thing as this guy does. Hold the string on the thumb and let the yoyo spin horizontally. If you want to tighten the string, throw to the right. If you want to loosen in the string you should throw to the left. You can make the yoyo pop up into the air and when it reaches your throw hand’s level you can wind up the yoyo by slightly tugging it. The picture tricks are the base for every beginner. Also, try the other tricks to add them to your skill set and show off your talent to your friends and family. Happy yo-yo-ing! If you have any questions, feel free to ask me in the comments. I will reply to them as soon as possible. Your post makes learning to yo-yo look easy! Thanks so much for all of this information. I’ve been curious how people control and learn these tricks. Awesome! Happy to know that, Tama! Don’t forget that practice and perseverance is the key to learning new tricks!